So, me and Ritcha were on a shopping spree in our local market when we found these little wonders. What are these – Incolor 2 sided lippies. One side is color cream and other side is gloss. Ohk, now what is this color cream? IS this cream…means give creamy finish? Nope? It is like a lip paint. The finish is almost like our high end wonders give like Nyx lip creams or Limecrimes!! So!! Even if the finish is same or not, there is no harm in trying ;). The toughest part is to find this lippie online or in stores. What is incolor? I don’t know!! Where does it come from? No idea!! Who stocks it up? No idea!! Are the products real/ not fake? No idea!! You have to decide for all these factors. But considering the finish and quality of the lip color, I would surely ask you to try it. Round plastic double sided tube – one side is lip color and other side is gloss. Applicators of good quality provided on both sides. No leakage or spilling, perfect for travels or be in your bag. It is liquid in texture and when you apply it on lips, it is glossy but turns to perfect matt within seconds and won’t budge after that. So, be cautious while applying. The gloss provided on other side can be applied on top of it to give a perfect glossy finish. Very pigmented. 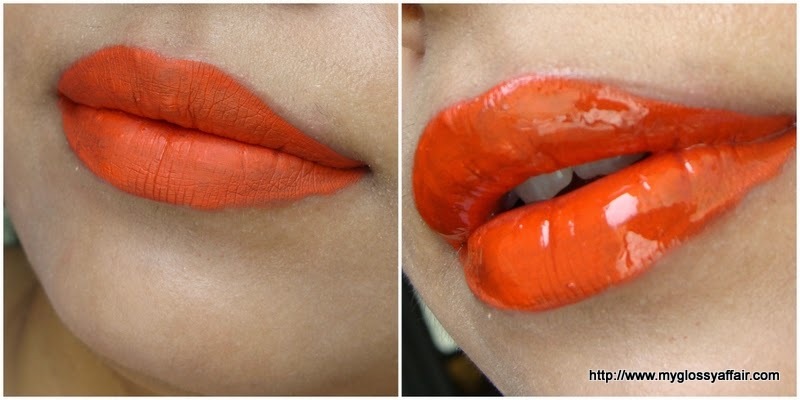 One coat is enough and covers pigmentation on lips very well. I have got 4 colours and with some colours, you need to apply it properly to avoid patches. But, a perfect application mostly. The colours are all very bright and bold. This orange makes you stand out, so choose wisely. You need some real courage to sport it ;). I have got two almost similar oranges. One is this and other, I wanted to be a dupe of MAC Chili ;)….hehehe. Though that is not a dupe but a good match to Chili. It applies like a lip gloss on lips but dries to a totally matt texture. It goes dry on lips like any super matt lip color, moisturise your lips beforehand. These are real good stains and super affordable too. Get one of your choice if you can find them 🙂. Super matt finish. Super glossy finish. Gloss and color, both provided in a single tube. Great range of normal and bright hues. Stays on for almost whole day. No creasing, bleeding or feathering. Incolor cosmetics is hard to find. No ingredients list or in fact, any details about the product I could find anywhere. Lips tend to go too dry if gloss is not applied but it happens with almost all super matt lip colors. Considering the price and quality, I would surely recommend them and repurchase them. If you are a fan of matt texture and able to find this wonder anywhere in this small world, then do get one. You would love it!! This looks like a great lip product! I love matte texture nowadays! This could very well be a dupe of NYX Soft Matte Lipcreams! Wow the lip color rocks on you. It's a super hott color!! Stunning!!!! That shade is so pretty!! Oh wow, that shade is absolutely stunning! 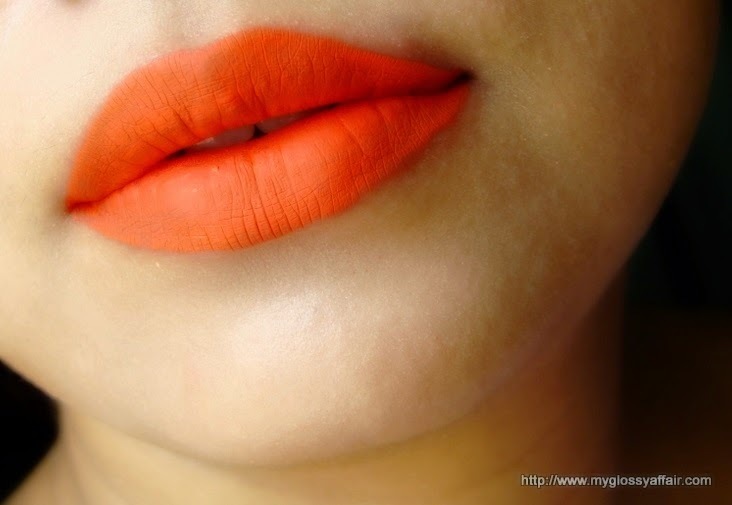 I am a huge fan of orange lippie and that is just perfect! it's great!! very nice color!! i never heard of the brand but the pigmentation looks amazing 😀 where do we get it ???? Wow that's a beautiful color!! Lovely colour. So pigmented too! Love this color! Want to follow each other in instagram? Great post! Thank's for sharing. What a stunning shade! I have recently started to wear orange…it's really growing on me. OMG.. what a pretty color ! totally totally loved it ! Hahahaha I haven't heard of this brand either so I can't answer those questions! Though I don't think it's "fake". I do love the colour though, bright and very cute. Thank you for a lovely comment on my blog! I followed you. Such a great review, this lipgloss sounds great! 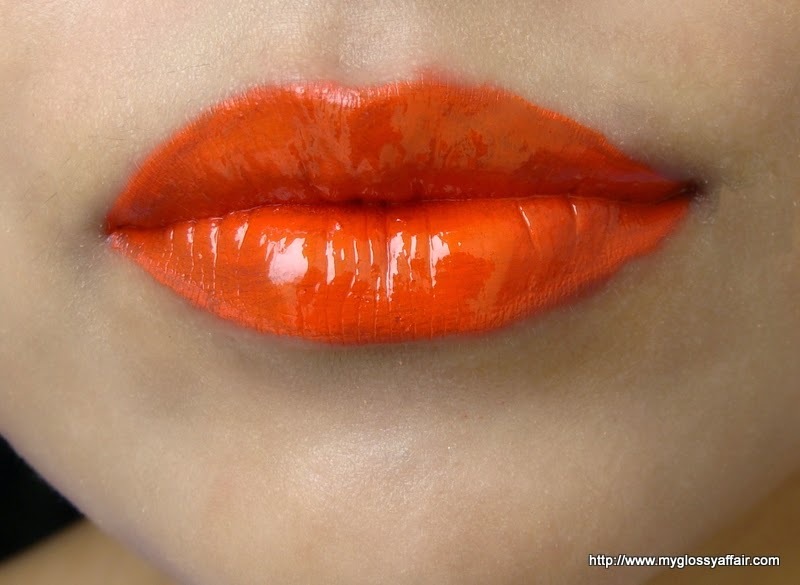 I love orange on my lips. Wow that colour is amazing! I like it without the gloss too. oooohhh…Thats gorgeous! 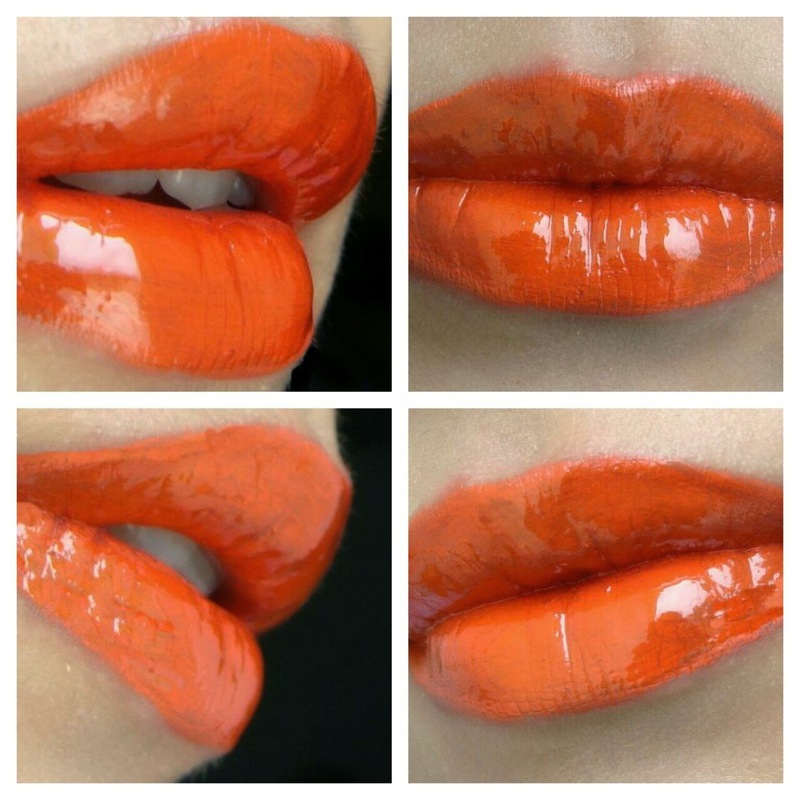 Super Stunning Lip Swatches Babe…..This loooks like a lovey range! Whoa.. what a hot shade!!! I love that matte and glossy! in love with the swatches! gorgeous! I think it looks stunning on you. have a nice day swettie!! I so love the lip colour. Its gorgeous. Wish I could lay my hands on it.